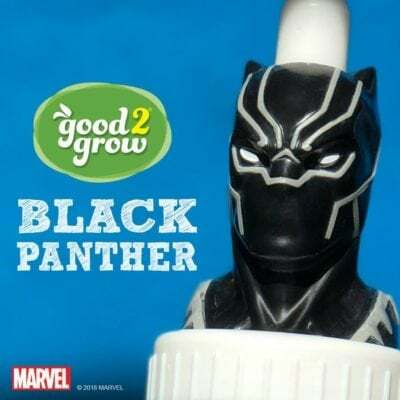 Just in time for Avengers: Infinity War, good2grow has released its lineup of your favorite characters from the movie. Look for Spiderman, Iron Man, Black Panther, Hulk, Captain America, Thor, Rocket and Groot at participating retailers. Collect them all to assemble your own team of superheroes! 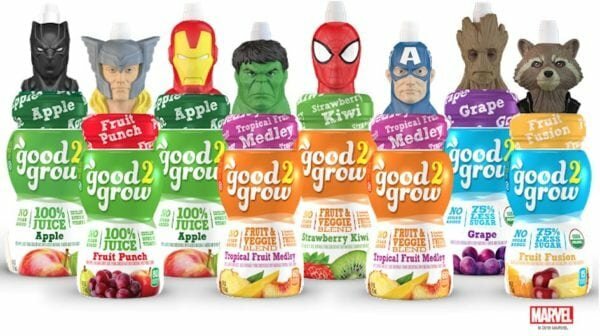 good2grow offers an innovative line of healthy children’s beverages featuring collectible 3D character tops that not only make nutritional products fun for kids to drink, but also help parents reinforce good dietary habits. Reader Giveaway: One lucky Jinxy Kids reader will receive a 4-pack of AMC tickets and good2grow juices to go with it. To enter, complete the entry form below by 11:59 pm ET on 6/4/18. Good luck! I would enjoy these drinks with my nephew and would go to see Jurassic World. Thanks for hosting the giveaway. These drinks look like alot of fun. We will share this with Samantha and Grady. my sister and her kids. My daughter will be enjoying these juices and the movie with me if I win. My 4 kids! We love watching movies! I suppose my 2 kids will want to go to the movies anytime. My son gets one of these juices every time he goes with me to the grocery store! I would enjoy the drinks and movies with my daughter. I would enjoy them with my daughters. i’d love them w my daughters! I will be enjoying them with the grandkids! my 3 kids will be enjoying it! I would enjoy these drinks with my sons who are huge Marvel fans. My kids will enjoy the juices and the movie if we win! These would be great to enjoy at the movies with my 4 year old granddaughter and 12 year old daughter this summer. My daughter would love these and to go to a movie. My grandson Jerrad and granddaughter Julianna would love all of this! I will share with my grandkids and we will probably see a Disney movie. My husband will be enjoying the movie. My grandson loves the juices. I just bought him the Spicerman on Sunday! My grandsons will enjoy both. I would take the kids in the family to see this movie with me. My son’s and I will be enjoying the movie tickets and the juices will be enjoyed by the kids I work with. My husband and I will enjoy the movie! My preschooler loves good2grow juices. If I win, I will enjoy the movie and my daughter will enjoy the juices. Thanks for the giveaway! My niece and nephews would be enjoying the juice and movie with me! Thank you for the chance to win! I’d enjoy the juices with my sons. Sadly, they’re both too young for Black Panther, so I’d see that with a friend and take them to see something else. My sons and nephew will enjoy this. I would enjoy with my whole family. My little brother would love it! My niece will enjoy the juices! My 6 nieces and nephews! I would be enjoying this prize with my son and daughter. “Let us know who will be enjoying these juices and the movie with you if you win.” A deserving relative who enjoys juices and movies! I would like to go to the movie with some friends and give the juice to some young cousins. We would all go out together; me, my husband, and our children. I’d love to go with my daughter and her friend. I would enjoy both with my girls. thank you! I would love to take my 3 little cousin to AMC with the juices! We plan on going a few times this summer. I would enjoy this with my three children. I would share with my boys and we’d love to see Incredibles 2 coming next month! I’ll share them with my best friend’s twin daughters and their Mom and I can all go to the movies together! Sounds fun! The family will enjoy these. I would enjoy them with my daughter. My wife and kids will be. The kids and I will tottally go see Jurassic World! I’ll be taking my kids to the theater- I’d like to see the Incredibles 2. My son and I will be enjoying these juices and the movie together. I have 4 kids, they would love these! i will be sharing these with my kids. we will love them. I would share the juice with my kids. I would take my family to the movies. Thanks for the chance! I would be watching them with my kids. This would be enjoyed with my oldest niece and nephew!! I’d enjoy this with my daughter! I would Watch the movies with my beautiful kids. Thanks for the awesome Giveaway. I will share these with my grandson. He loves juice and he really loves movies! Thanks for the giveaway! My girls would love the juice. I’m not sure what movie we would pick though. I would share the movie tickets with my hubby and two sons and they would love the juices also! I would take my younger brother to the movies. My daughter would love the juices and we would all go enjoy a movie together as a family! My little one of course! I would enjoy this with my kids. I want to see the Han Solo movie. I would be enjoying them and we would see a family friendly movie. I will drink these with my cousins or my goddaughter! I would share this with my daughter. We love movies and juice. My granddaughter will be enjoying these juices if I win! These are super cool and my daughter Chloe would LOVE this! I would go with my wife and daughter. I would go with my daughter and my husband. I will enjoy the juice and movie with my kids. Little Maradee would enjoy this! Probably with my sweet husband. We’re “big kids”, lol. Thanks and God Bless! I have 6 grandkids that would love to go to the movies! My three daughters would love these! We buy them at the store all the time. I’d take them out to see a movie of their choice. I would take my sister and her 2kids and they would love the juices! I would enjoy the juices and movies with my nephew this summer. I would love to share these with my nieces and also see the new Icredibles! The juices I’d share with the kids I nanny, but I’d take my brother and a couple of friends to the movie. I will go with my kids and my husband! Good idea to take on picnics for the little ones. I’d enjo these with both of my kids and watch Incredibles 2! My nephew would be enjoying this! Our granddaughter would enjoy these juices. She would love to see The Incredibles. The juices I will share with my family. I will go with my buddy to see Deadpool 2. My children would love the juice. I’d like to watch Deadpool 2. My little boy would love it. and he would share with all his nieces. I mean cousins my nieces lol sorry? I dont know why I didnt read it before I sent it. I am sorry. I will share with my daughter and son! They would love these. My nephew would enjoy the juices. And I might take him with me to the movies. My grandchild will be enjoying the juices and movies with me. Gifted to my neighbor’s (Lisa’s) kids.